Established for over 50 years, the Central Private Hotel located in the heart of Sydney offers excellent service at affordable rates. The hotel’s location makes it an easy walk for guests to Sydney’s China Town, the famous Paddy’s Markets, Sydney Town Hall, the Sydney Entertainment Centre, Hyde Park, Queen Victoria Building and Darling Harbour. With easy access to transport and amenities, be sure to experience a friendly and comfortable atmosphere while you travel in Sydney. 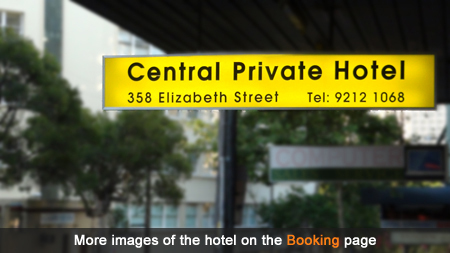 The Central Private Hotel is Central Sydney’s best budget accommodation. Popular with the price-conscious traveler, the hotel has a large selection of budget single and double rooms with shared, cubicle bathing facilities. Our spacious Ensuite rooms offer busy travelers a quiet escape for the evening with private bathing facilities. Our hotel provides all guests with free Wi-Fi Internet access in order to help you conduct your business or plan that next trip. Our hotel rooms also provide guests with a mini-bar fridge, flat screen TVs, on-site laundry and dryer access during business hours, and fresh linens, towels and soap. Reception has electronic goods such as oscillating fans, hairdryers, and a microwave available upon request. All rooms have freshly stocked teas and coffees daily. Why Choose Central Private Hotel? Only a minute away from Central Station via Elizabeth Street.